I had the great pleasure to meet Veronika Miller at a Tweet-up during one of the big tile shows earlier this year. Veronika is a good Twitter friend. She provides support and happiness throughout the day with her Tweets. Also, Veronika is an interior designer who caught my attention as she explained her vision, Modenus. I could see right away Modenus was a better mousetrap with some great tools destined to become an online design resource centered on creating a community. The site has been in development for most of this year and now is now ready to launch. The service is free for designers. I encourage manufacturers and vendors to place their products on the site as well. What better what to keep your products in front of cutting-edge designers needing a source for their next project? Online design resource launches – and it's free! "No one needs to tell interior designers that times are tougher. We are launching Modenus to help them make the most of challenging business conditions by offering them free tools to work more profitably, a platform from which to network with peers and meet potential clients and a curated catalog of products from the US, Europe and beyond, putting new and exciting resources at their finger tips." "But it's not just about Designers. Manufacturers are entirely free to engage with consumers and designers and can set up distribution channels that best serve their business model. Manufacturers can list showrooms, retailers, E-commerce outlets and even design studios that carry their products to provide the consumer with the most sensible avenue to specify or buy." "But our efforts won't stop at products. We want Modenus to be a bridge that connects designers and consumers across continents. So many design professionals are now prepared to consult virtually or to travel for a great job, why not shake the geographic restraints and use a platform like ours to find a designer, a client or a product anywhere in the world. Business isn't what it once was but that doesn't mean there aren't new opportunities." Have a look for yourself at www.modenus.com or join the team on www.twitter.com/modenus ! If you would like more information about Modenus, please contact them at 407-376-4192 or at press@modenus.com and www.twitter.com/modenus. My good Twitter friend and Marketing Guru, CB Whittemore, often casts pearls of wisdom at me. She is the primary contributor for the Simple Marketing Blog and one of those pearls that I've been dodging is to make my blog more 'human' and to let folks know "my story". She encourages me to 'lighten it up a bit' and follow the great story-telling techniques of Paul Anater's fun and information blog, Kitchen and Residential Design. By now, you are asking, what does any of this have to do with cement tile manufacturing standards? In this post, you'll learn a bit more about me and gain a better understanding of what quality standards govern cement tiles. I've been selling cement tile for about eight years. I love the product. However, it can be a difficult sell because folks aren't familiar with it. Recently, I was working with a designer on specifying Cuban Heritage cement tiles for a commercial floor application in Las Vegas for a casino and coffee shop. The designer was encountering some resistance from the rest of the team. She asked if I would discuss the quality and manufacturing standards with her design team. Two questions came up in our meeting that I didn't answer very well. What testing specification are the tiles made to so that we know the floor will be durable? Unlike ceramic tiles, cement tiles are not manufactured to conform to TCA – ANSI standards for the class/application. What standard do they confirm to and have they been tested to ensure quality for our application? I don't know. I thought they were fair questions. (This is where you get to learn something about me.) You see, my college degree was Mechanical Engineering. It was a "default degree" because I liked math and science and wanted a job after I graduated. I enjoy problem solving and want to understand how things work. As an Engineer, I asked similar questions and found answers before I would agree to using any product. 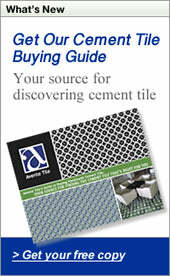 I turned to one of the best manufacturers of Cement Tile, Aguayo, to get the answers. Jorge Aguayo is the vice president of this company. I've worked with Jorge for many years and he I've visited their manufacturing plant and seen installations in large, commercial applications that demand both quality and durability. Because cement tiles are not a mass-marketed or mass-produced product, no standards have ever been developed. It's like asking if an Oscar de la Renta gown is ISO 9000 compliant. There you have it! There aren't standards that govern this product. Cement tiles are a great product. However, since there are no quality standards, where you buy is almost as important as what you buy. Make sure to purchase them from a knowledgeable seller that you trust and know. Equally important, the vendor needs to understand the product, source it only from a reputable manufacturer, and provide the service and support required for your installation. The tiles will last a lifetime, if you use follow this advice. With all the decorative tile at Avente, it's easy to forget that field tile can lend your living space the same warmth and originality. Avente's Yucatan tile is made-to-order by craftspeople dedicated to a tradition of functional, natural beauty. First, let's take a second to define "field tile." Field Tile is tile found in the main field or area of the installation covering the wall, floor or countertop. Field tile are usually a solid color or lack a specific design or pattern which distinguishes them from decorative or "deco tile." These three installations will help you understand when you need to consider a high-quality hand painted artisan field tile for your project. Use Yucatan Field Tiles with natural stone because the hand-painted tiles create a rich, complex glaze that is not a single color. The Yucatan Tiles are ideal where the tiled surface must be durable and chip-free like kitchen counters, spas or floor entryways. These tiles are vitreous meaning the tile body is very dense with less than 3% water absorption. The tiles are frost proof and ideal for wet areas such as pools and spas. Hand painted field tile works well with decorative tile because of the variation in glaze colors. Also, our Yucatan Tiles are available in all sorts of sizes from dots to 6"x6" including trim, molding and liners! With over 50 glazes, we can find a color to work with your design. We keep sample stock of most glazes and can get additional pieces within two weeks. To help you get more acquainted with this versatile line, we are offering 15% off all Yucatan tile purchases through October 31, 2010. Mention the "Fall Special" when placing your phone order. Offer not valid with any other discounts or coupons. The email arrived at 8:54 AM. The message read, "I wanted to let you know that our kitchen featuring Avente Cuban Heritage Tile is in this month's This Old House magazine. I have attached a photo so you can see how it came out. Thanks for the beautiful tile!" Cuban Heritage Cement Tile Backsplash. Photo courtesy of Buckminster Green. Moments like these make my day! When I get a photo of a tile installation from one of our wonderful customers! Yep, that moment is gold. I know the customer was looking for something special and found it at Avente Tile. Then, they worked through the design and installation issues. The project is done and, now, they're just lovin' it. But, they still took the time to send me a picture. I had one of those moments yesterday. So what are you waiting for? Pick up the October issue of This Old House. On page 37, they feature the Cuban Heritage Design 110-2B cement tile on the kitchen backsplash. You can also hop over to Buckminster Green's Gallery. The first three images show different views of this installation. I want to thank the fine folks at Buckminster Green for choosing our tile and making my day! Buckminster Green is a general contracting company in Philadelphia, Pennsylvania specializing in green home remodeling. You can view the entire Cuban Heritage cement tile catalog online or check out the details on the Cuban Heritage Design 110-2B.